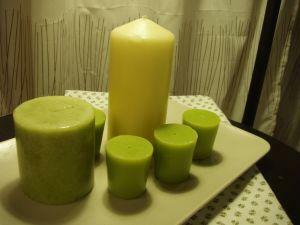 Bayberry candles have a sage green color. For many people, the fragrance of bayberry candle scent is reminiscent of Christmas and New Year's traditions. According to legend, bayberry candles were the first scented candles made in colonial America. The early settlers of the Eastern coast quickly discovered they could make candles from the wax residue that resulted from boiling the bluish grey berries of the bayberry shrubs. The sweet-smelling bayberry candles were a welcome change from the tallow candles, typical of the times. Tallow candles, made from animal fat, burned with a foul odor and released a lot of soot. The bayberry candles burned cleanly since they were made from natural wax. Although the two types of bayberry bushes, the Myrica Pensylvanica known as the Northern Bayberry and the Myrica Cerifera known as the Southern Bayberry, were plentiful along the entire Eastern coastline and as far west as Texas, making bayberry wax was very time consuming and tedious. Even today depending on moisture availability, it still takes from three to fifteen pounds of bayberries to make a single pound of bayberry wax. The colonists are said to have treasured their special bayberry candles. They considered them luxuries and saved them for special occasions. Many colonists lit their bayberry tapers on the eve of a special day such as Christmas or New Years. As years passed, more people lit their candles on those special evenings and the tradition of burning a bayberry candle at the holidays began. The tradition of burning a bayberry candle on Christmas or New Year's Eve is still carried out today. There is not any religious significance to burning the candle. Instead it is a local tradition in certain regions, especially the Northeast. Today people either choose to light their bayberry candle on either Christmas Eve, New Year's Eve or both. Allowing the candle to burn down completely, or until it goes out on its own, is said to bring prosperity and happiness to those in the household. Traditional pure bayberry wax candles generally do not have any additional scent added. The wax itself is all that is needed to provide the wonderful fragrance. Some companies make bayberry candles that are a blend of bayberry wax and beeswax. The blended wax is not as brittle as bayberry wax alone and is less apt to be damaged during shipping. Allegheny Candles offers beautiful authentic bayberry tapered candles that are perfect for holiday traditions. Each bayberry candle comes with the Legend of the Bayberry Candle and a copy of the Bayberry Candle Poem. In addition to authentic traditional bayberry candles, Allegheny Candles offers bayberry scented jar candles and votives. Although these candles are made without bayberry wax, they still provide the bayberry scent at a much lower cost. Peak Candle Supply offers bayberry fragrance oil in sizes ranging from one ounce to two pounds. Their scented fragrance is safe for use in wax candles, skin products and soaps. Colonial Candle Craft offers a single or double bayberry candle in a beautiful gift complete with the Bayberry Story and Poem.